Background Nephronophthisis (NPH) is the most prevalent genetic cause for ESRD in children. However, little is known about the prevalence of NPH in adult-onset ESRD. Homozygous full gene deletions of the NPHP1 gene encoding nephrocystin-1 are a prominent cause of NPH. We determined the prevalence of NPH in adults by assessing homozygous NPHP1 full gene deletions in adult-onset ESRD. Methods Adult renal transplant recipients from five cohorts of the International Genetics and Translational Research in Transplantation Network (iGeneTRAiN) underwent single-nucleotide polymorphism genotyping. After quality control, we determined autosomal copy number variants (such as deletions) on the basis of median log2 ratios and B-allele frequency patterns. The findings were independently validated in one cohort. Patients were included in the analysis if they had adult-onset ESRD, defined as start of RRT at ≥18 years old. Results We included 5606 patients with adult-onset ESRD; 26 (0.5%) showed homozygous NPHP1 deletions. No donor controls showed homozygosity for this deletion. Median age at ESRD onset was 30 (range, 18–61) years old for patients with NPH, with 54% of patients age ≥30 years old. 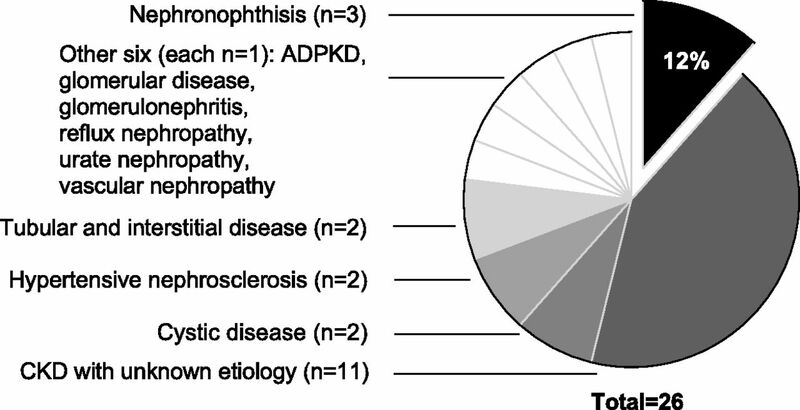 Notably, only three (12%) patients were phenotypically classified as having NPH, whereas most patients were defined as having CKD with unknown etiology (n=11; 42%). Conclusions Considering that other mutation types in NPHP1 or mutations in other NPH-causing genes were not analyzed, NPH is a relatively frequent monogenic cause of adult-onset ESRD. Because 88% of patients had not been clinically diagnosed with NPH, wider application of genetic testing in adult-onset ESRD may be warranted. Quality control was performed by excluding all low-quality SNPs, leaving only high-quality SNPs (call rate >0.99; Hardy–Weinberg equilibrium P>0.001; minor allele frequency <0.1) that were linkage disequilibrium pruned to leave no pairs with r2>0.2. Also, we removed SNPs in regions with known long stretches of linkage disequilibrium and nonautosomal SNPs. Only data on the 5606 patients with adult-onset ESRD (start of first RRT at 18 years old or older) were analyzed: n=3192 from the DeKAF Genomics and Gen03 combined cohorts, n=1230 from the TransplantLines-Genetics cohort, n=500 from the GoCAR cohort, and n=684 from the Vienna cohort. The data generated were used to determine autosomal CNVs (i.e., deletions and duplications). CNV calling was performed using the default settings of two well published algorithms: the BRLMM-P algorithm designed by Affymetrix Inc. (DeKAF Genomics, Gen03, and TransplantLines-Genetics) or PennCNV (GoCAR and Vienna).21,22 All calls with logR ratio SD >0.3, B-allele frequency drift >0.01, waviness factor >0.05, or waviness SD >0.15 were excluded. Loci where no definite copy number call could be made were also excluded from further analysis. Demographic and phenotypic information was retrieved per cohort for all patients with adult-onset ESRD, which was defined as start of first RRT at 18 years old or older. For patients with adult-onset NPH, we studied various phenotypical characteristics, namely the age at ESRD onset (defined as age at first RRT [dialysis or transplantation]), ethnicity, and primary renal disease diagnosis. If patient consent (discussed in Ethical Constraints below) allowed for data retrieval from the patient file, data on family history, hypertension, polyuria, proteinuria, and extrarenal NPH-associated anomalies were retrieved. Ethnicity was determined by principal component analysis using 1000 Genomes Phase 3 data (1092 samples and 14 different ancestries).23,24 Populations were determined by visual inspection of the first two principal components (by J.v.S.). Descriptive statistics were generated for the demographic and primary renal diagnosis variables using SPSS (version 23 for Windows; IBM Corp., Armonk, NY). Additionally, we applied a two-sided Fisher exact test to assess these binomial variables. All samples were also analyzed on identity by state patterns to identify patients who were related up to and including to the third degree (identity by state <10%). The enrollment of participants for all iGeneTRAiN Consortium cohorts was approved by the institutional review boards of the hospitals at which participants were included. All participants signed informed consent for genomic data analysis via SNP array. For the GoCAR cohort, TransplantLines-Genetics, and Vienna cohorts, the principal consent form included retrieval of relevant information from their patient file. Participants enrolled in the DeKAF Genomics and Gen03 cohorts had to additionally consent for data retrieval from their patient file. Furthermore, participants were not asked to consent to return of genomic study results on an individual level. Thus, we could not notify NPHP1 homozygous or heterozygous gene deletion carriers of this finding. In total, 5606 renal transplant recipients with start of first RRT at any age ≥18 years old were included. Overall descriptive characteristics of the five cohorts were reported previously by the iGeneTRAiN Consortium.19 Of these patients with adult ESRD onset, 26 (0.5%) patients (Figure 1) displayed the same approximately 96,389-base pair deletion (size on the basis of SNP array) (example in Figure 2) on both alleles, including all NPHP1 gene exons. The 26 patients were not related up to and including to the third degree. Homozygous NPHP1 full gene deletions have an overall prevalence of 0.5% in adult onset ESRD patients, while the prevalence is even 0.9% in patients aged 18–50 at ESRD onset. The number of renal transplant recipients (n) in the five combined cohorts is displayed by age decade of start of RRT. The number of homozygous NPHP1 full gene deletion carriers (n) and the percentage per specific age category are shown above each bar. None of the 3311 (donor) controls displayed this homozygous deletion. None of the 5606 recipients showed a deletion of any of the other 19 known NPH genes.6 Markedly, we detected a higher number of heterozygous NPHP1 deletions in transplant recipients (n=36) compared with the transplant (donor) controls (n=10; P<0.001). Although these patients were not additionally assessed with next generation sequencing, this finding points to the possibility of compound heterozygosity (a full gene deletion on one allele and a different pathogenic mutation on the other allele) in the recipients. When addressing the phenotype of the patients with NPHP1 deletions (Figure 1 and Table 1), the median age at start of RRT was 30 years old (range, 18–61), with 14 patients (54%) ages 30 years old or older. Interestingly, the prevalence of homozygous NPHP1 deletions was 0.9% in recipients between 18 and 50 years old at the start of first RRT (n=24 of 2794) and even higher (2.1%) in recipients ages 18–29 years old (Figure 1). Regarding the clinical primary renal disease diagnosis, only three patients (12%), of whom two were younger than 30 years old at the start of first RRT, were classified as having NPH (Figure 3). The other patients (88%) were diagnosed with CKD with unknown etiology (n=11), cystic disease (n=2), hypertensive nephrosclerosis (n=2), tubular and interstitial disease (n=2), glomerular disease (n=1), GN (histologically examined; n=1), sporadic primary reflux nephropathy (n=1), vascular nephropathy (n=1), urate nephropathy (n=1), and autosomal dominant polycystic kidney disease (n=1; no mutation in PKD1 or PKD2). Only 12% of homozygous NPHP1 full gene deletion cases were correctly identified as having nephronophthisis, while 88% were clinically diagnosed as having something other than nephronophthisis. Two patients displayed extrarenal anomalies associated with NPH, namely congenital blindness (possibly Senior–Løken syndrome type 125) and severe neurodevelopmental delay (possibly Joubert syndrome type 426). Both of these patients had not been clinically diagnosed with NPH but with hypertensive nephrosclerosis and GN (histologically examined), respectively (Table 1). Our data indicate that, with a 0.5% prevalence of homozygous NPHP1 full gene deletions, the frequency of NPH in adult-onset ESRD is considerably higher than previously reported.6,16 When interpreting our results, one should note that, inherent to the method applied in our study (which only analyzes larger deletions and duplications), the overall prevalence of NPH in adult-onset ESRD that we report here is very likely to be an underestimation (Figure 4). First, with this method, any combination of two smaller NPHP1 mutations, such as (homozygous) pathogenic intragenic deletions up to approximately 700 base pairs and single-nucleotide variants, could not be analyzed.22 Because this is outside the scope of this study, compound heterozygosity and homozygosity for other mutations were not assessed. The assumption that NPHP1-related disease is probably more frequent in adult-onset ESRD is supported by our recipients showing a significantly higher frequency of heterozygous deletion carriers than donors, suggesting that a subset of these deletion carriers likely also carries a second mutation on the other allele. Second, the causative mutations in other NPH genes generally are not recurrent full gene deletions.5,6 This is underscored by the fact that our analysis showed no large deletions in these genes.6 We have not performed any (additional) next generation sequencing to assess any other types of mutation. In the light of these two considerations, our findings point to an underestimation of the number of causative NPH mutations in the overall cohort. At least one in 200 (0.5%) patients has all adult-onset ESRD due to nephronophthisis, but the overall prevalence is likely higher. The late presentation of nephronophthisis might be due to genetic modifier effects. Accurately diagnosing a monogenic disease such as nephronophthisis can have wide-ranging clinical implications. With regard to age at onset of ESRD, over one half of the patients with NPHP1 in our study were 30 years old or older at first onset of ESRD. Therefore, we postulate that NPH is not merely a pediatric disease entity. In the literature so far, only six patients across four families have been described with NPHP1 mutations and ESRD onset after 30 years of age, with the oldest being 56 years old.13–15 Our study extends this age of onset to 61 years old. In the subpopulation with onset between 18 and 50 years old, we observed an NPHP1 deletion prevalence of 0.9%. The mechanism leading to phenotypic variance in age of ESRD onset remains unclear. It has been hypothesized previously that this nonpediatric onset of ESRD, especially after 30 years old, is due to the influence of yet unknown modifier genes.14,15 Because of the ancestry composition of our cohorts (the majority being Caucasian; data not shown), we could not analyze the presence of distinct ethnicity-specific modifier effects.6,8 Nevertheless, modifier effects, whether ethnicity specific or not, could play a role in the discrepancy in age at onset between the patients in our report and those in older literature. In summary, we are the first to show in a large cohort that NPH due to NPHP1 homozygous full gene deletions has a prevalence of one in 200 patients (0.5%) in all adult-onset ESRD. Although the incidence was clearly higher in patients with an ESRD onset between 18 and 50 years old (prevalence of 0.9%), NPH can have an onset at up to 61 years of age. Because the method that we used underestimates the total number of causal mutations, we conclude that NPH is a relatively frequent monogenic cause of adult-onset ESRD that is likely underdiagnosed in current daily practice. Given the potential clinical implications of having a genetic diagnosis, our data warrant wider application of genetic testing in adult-onset ESRD. The authors thank Affymetrix Inc. (Santa Clara, CA) for performing part of the copy number variant calling using their BRLMM-P algorithm.21 All images in Figure 4 were purchased from thenounproject.com under a royalty-free license. For two images, the color was changed from black to gray, and one image was cropped to ensure adequate fit. The DeKAF-Genomics cohort and the GEN03 cohort were supported by National Institutes of Health/National Institute of Allergy and Infectious Diseases grants 5U19-AI070119 and 5U01-AI058013. R.S., N.V.A.M.K., and A.M.v.E. are supported by Dutch Kidney Foundation grants KSTP12.010, 15OP14, and Kouncil CP11.18, and A.M.v.E. is supported by NutsOhra Foundation grant 070-1303. Z.Z. is partially supported by the Translational Collaborative Research Initiative Grant from the Icahn School of Medicine at Mount Sinai. See related editorial, “The Underestimated Burden of Monogenic Diseases in Adult-Onset ESRD,” on pages 1583–1584.